The only people who’ve paid any price for our military involvement in Iraq and Afghanistan are our military families. We believe that if this war is to be fought, it’s only fair that everyone share the burden. That’s why we are offering legislation to impose a graduated surtax so that the cost of the war is not borrowed. The subtext here is that Obey and cosponsors like John Murtha and Charlie Rangel are against sending more troops to Afghanistan, so the effect of the bill would be to make Americans who don’t have family members in the service more immediately aware of the continued costs of the war (in that way, it’s not unlike when Rangel introduced a bill to reinstate the draft in the run up to the war in Iraq). Of course, the bill has little chance of passing. But there may be one way for Obey and his colleagues to help their case: by invoking the strong historical precedent of raising taxes in times of war. Since the War of 1812, higher taxes have essentially gone part and parcel with war--the two current wars being the exceptions. In fact, the Bush tax cuts are perhaps the only instance in our history of substantial tax cuts during a time of war. 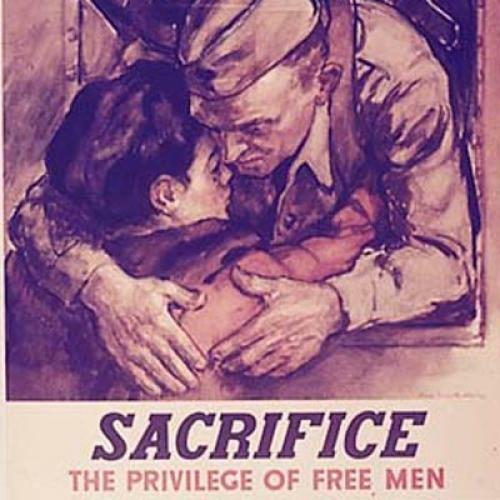 Last year, The Urban Institute published a book called “War and Taxes,” that outlined the long history of “shared sacrifice.” “Indeed, the history of America’s tax system can be written largely as a history of America’s wars,” they wrote. Taxes from 1812 to 1815 that targeted retailers, sugar, carriages, and other items helped fund 40% of the War of 1812. The Civil War saw the nation’s first income tax--from the Union in 1862 and then the Confederacy a year later. World War II incorporated about 35 million previously untaxed citizens into the tax structure, in what would be the “most thorough revision that the internal revenue laws have yet received.”(To sell the tax to constituents, the government launched a campaign that employed the likes of Donald Duck quacking, “Taxes to beat the Axis!”) And during Vietnam, despite a reluctant President Johnson, a 10-percent surtax was added to the federal income tax. (In response more than a thousand people refused to pay their taxes in protest, including the wife of Michigan Senator Philip Hart.) During World War II, higher taxes were seen as necessary to defeat an enemy that had attacked American soil, and during the Vietnam war, in the face of immense public opposition, the efforts to raise taxes faced complex legislative hurdles. But the taxes were almost always justified as matters of necessity, often as a last recourse to fund a war that became more expensive than administrations originally anticipated. Obey and his cohort have little chance of seeing their bill pass. But if they truly want to garner support for the surtax, it may do them well to take a page out of the history books. True, Donald Duck may be a little dated. But maybe Miley Cyrus is available?